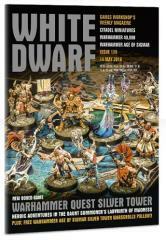 #120 "Warhammer Quest Silver Torch"
Behold, the Silver Tower! That’s right, there’s a stunning new boxed game – Warhammer Quest Silver Tower – on the horizon and we’ve got the complete lowdown in this bumper-sized issue. Six new heroes from the noble Knight-Questor to the shadowy Tenebrael Shard – brave the depths of the Gaunt Summoner’s Silver Tower and are met with a whole host of sinister denizens. We take a look and play through the first of the game’s nine quests, plus we kick off the first of a two-part Paint Splatter feature with stage-by-stage guides for the Darkoath Chieftain and Tzaangors. But that’s not all – an eight-page pullout section in the middle of the magazine provides you warscrolls for using all of the heroes from the game in your games of Warhammer Age of Sigmar! The mysteries of the Silver Tower may be many, but White Dwarf 120 is truly your guide to all of them. Get one now.